It's really impressive how quickly the Wall Street Journal's Mary Anastasia O'Grady had the pro-coup talking points ready to go for Honduras. Apparently waking up a country's president, bundling him into a plane to Costa Rica and installing a new president while the nation is under curfew is all just protection of democracy. It's strange that no one came up with that idea for getting Al Gore into the presidency after the 2000 election. By leveling the playing field for our products, CAFTA will help create jobs and opportunities for our citizens. As CAFTA helps create jobs and opportunity in the United States, it will help the democracies of Central America and the Dominican Republic deliver a better life for their citizens. By further opening up their markets, CAFTA will help those democracies attract the trade and investment needed for economic growth. This economic growth will boost demand for U.S. goods and reduce poverty and contribute to the rise of a vibrant middle class. This economic growth will raise working standards and will deliver hope and opportunity to people who have made the choice for freedom. The more opportunity that Central Americans have at home to provide for themselves and their families means it's less likely that someone looking for a job will try to come to this country illegally. By strengthening the democracies in the region, CAFTA will enhance our nation's security. Two decades ago, many of the CAFTA nations struggled with poverty and dictatorship and civil strife. Today, they're working democracies, and we must not take these gains for granted. These nations still face forces that oppose democracy, seek to limit economic freedom, and want to drive a wedge between the United States and the rest of the Americas. The small nations of CAFTA are making big and brave commitments, and CAFTA is a signal that the United States will stand with them and support them. By helping the CAFTA nations build free societies, we'll help them eliminate the lawlessness and instability that terrorists and criminals and drug traffickers feed on. And this will make our country safer. CAFTA is more than a trade bill; it is a commitment among freedom-loving nations to advance peace and prosperity throughout the region. As the oldest democracy in the Western Hemisphere, the United States has a moral obligation and a vital national security interest in helping democracies in our neighborhood succeed, and CAFTA advances this goal. That's a long passage to excerpt but it's needed to bring out how bizarre the theory was: better market access for US goods in Central America somehow induces these countries to get more investment which in turn makes them want to be more democratic and in turn the CAFTA deal means that US "stands with them" in support of their efforts to deepen democracy. But while you might have thought that one possible expression of Bush's idea is that the US should express concern when a CAFTA country bundles its president onto a flight to a Costa Rica, we now learn from the conservatives that in fact it's the bundlers and not the bundlee that we're supposed to be supporting as part of democracy promotion which in turn was due to earlier support for free trade. It's left as an intellectual exercise for conservative economists to prove that the bilateral trade in presidents between Honduras and Costa Rica is consistent with factor endowments in each country. 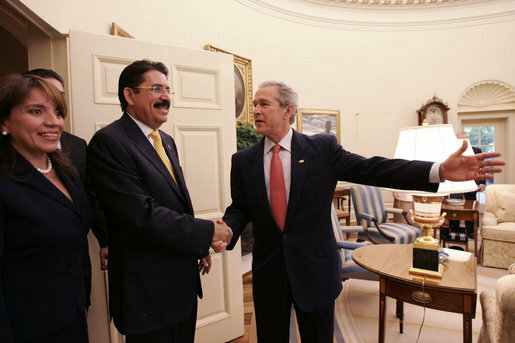 Photo: When George Bush and Manuel Zelaya were friends. Martin McAleese, the husband of the Irish president Mary McAleese, was working behind the scenes as the largest loyalist group, the UDA, dealt with the weapons issue. He helped persuade hardline Belfast loyalists like Jackie McDonald that they had nothing to fear from the peace process in general, and the Dublin establishment in particular. The two men not only talked at great length, they reportedly played golf together. It was an unlikely combination - an Irishman and an Ulsterman, a Catholic and a Protestant - swinging golf clubs rather than punches. According to the Financial Times wealth supplement today, there is a marketing and research category called the mobile wealthy community. Apparently they feel a tad stressed by the attention on their taxes, especially in the UK. But they have joined the ranks of communities. Le problème de la burka n’est pas un problème religieux. C’est un problème de liberté et de dignité de la femme. Ce n’est pas un signe religieux, c’est un signe d’asservissement, c’est un signe d’abaissement. Je veux le dire solennellement, la burka n’est pas la bienvenue en France. Nous ne pouvons pas accepter dans notre pays des femmes prisonnières derrière un grillage, coupées de toute vie sociale, privées de toute identité. Ce n’est pas l’idée que nous nous faisons de la dignité de la femme. We had betrayed our principles in the course of the Cold War, he said, "fought fire with fire, never thinking that fire is quenched with water." The Soviet answer to that brave, new world was the invasion of Afghanistan in December of 1979. To say the least, there was a lot going on in 1979 and presenting it as a simple Soviet slap in the face to a hand of peace is a tad simplistic. By the time the USSR forces were in Kabul, the year had already seen an Egypt-Israel peace treaty (and thus Egypt out of the Nasserite Soviet orbit), the revolution in Iran, the Islamist siege at Mecca, some dude named Saddam Hussein coming to power in Iraq, and a Polish anti-communist Pope visiting Poland. But that context -- of a USSR seeing both green and western encroachment in its satellites, is missing from Ajami's analogy. The alternative possibility is precisely that Obama has looked at 1979 and decided that if you poke too many beehives at once, you're headed for trouble. Unless you actually want chaos in the Middle East. The worse, the better, and all that. Who supplies equipment to the Iranian riot police such as the one shown above? The bike appears to be a Honda but the rest of his gear looks European. How about one concrete step to help Iranian democracy in figuring out where the government is getting these particular instruments of repression? UPDATE: Now there are reports that the government is using tear gas and water cannon to break up Saturday's demonstration. Same questions: where did they get them and will they restock? The letter [from Brian Cowen] which began: “I am writing to you in strictest confidence” was leaked to the media, apparently by British sources, as it was the copy in circulation that was sent to prime minister Gordon Brown. If it was leaked by British sources, how is it that, according to The Google, only the Irish Times appears to have had access to the complete text of the letter? The Council of the European Union today held a Very Important Meeting in Brussels. The key outcome of Days of Cliffhanger Negotiations among the prime and foreign ministers was a Completely Clear and Understandable declaration that the Lisbon Treaty says what it means and means what it says, and furthermore that future actions will be taken at some unspecified date in which the countries will further declare that their declaration that the treaty says what it means and means what it says also says what it means and means what it says. And all that cleared up, would youze all now please go and vote Yes in the September referendum to ratify the treaty. Above, the single photo of an Irish representative that appears among the 90 photos of today's council session in Brussels. James Von Brunn (the Holocaust Museum shooter) hated Christianity. Some people who lead alternative lifestyles or believe in witches don't like Christianity. “Christianity,” writes Hitler in Mein Kampf, “was not content with erecting an altar of its own. It had first to destroy the pagan altars.” It was “the advent of Christianity” that first unleashed the “spiritual terror” upon “the much freer ancient world.” Large segments of the cultural left today subscribe to similar notions. One brief point. Those leftie pagans are not obsessed with the Khazars the way actual Fascists were. That obsession represents something very large, something beyond the capacity of yah-booh pigeon-holing to capture. Right-wingers like Powerline's "Trunk" and Ed Morrissey are measuring Barack Obama's cautious rhetoric on Iran versus Ronald Reagan's on Poland in 1981 and finding it lacking. Apparently Reagan said a lot of tough stuff about the imposition of martial law in late 1981. But what was the impact? Of course any counterfactual can be conjured up to make an intervention look good. But there's little actual evidence that Reagan's interventions helped. Nor could one expect much. This was still the Warsaw Pact era with the USSR finely balanced between reactionary and patient instincts for its sphere of influence. The west had no capacity for direct intervention of any kind of Poland, not least with the Brezhnev Doctrine still in force. Aren't we supposed to take seriously the words of our "enemies"? Even simple things show no obvious improvement, though. Martial law -- the thing that Reagan spoke directly against -- wasn't lifted till summer 1983. Solidarity itself was banned in October 1982 (not during the martial law imposition period, by the way) and only legalized at the end of the decade. And the stepped-up repression of late 1981 was only unwound with the final collapse of communism in 1989. So what are the observable indicators that Reagan speaking up did an iota of good? Then back in 2003 when a reformist president was actually in office and the Iranian government was looking to improve relations with the United States, the Bush administration chose to strengthen the hand of Iranian hardliners by (a) labeling Iran part of an “axis of evil” (b) refusing to engage in bilateral dialogue with Iran (c) cutting off cooperation on Afghanistan and (d) invading Iraq. We then got Ahmadenijad in the 2005 election, and now we’re watching the 2009 election unfold right before our eyes. The Iranian people deserve a genuinely democratic system in which elections are honest - and in which their leaders answer to them instead of the other way around. The rest of the statement confirmed this tone and essentially told the Iranian people that any elections run by the existing rulers were useless. Thus a double irony -- those meaningless 2005 elections produced a worse outcome than if the US had shut up, and the current elections, run under the exactly the same system, have rocked the Iranian regime. And yet the policy that the neocons now want is for the US to insert itself into the process as it did in 2005. Which, yet again, is also what the ayatollahs want! One of the reasons we're supposed to be worried about Iranian President Mahmoud Ahmedinejad, stolen election and all, is that he keeps talking about the end of the world, hidden imams, weird stuff that will happen in the end-times -- and he's developing a nuclear weapon. Then there's the Middle East leader who in a major speech calls for the realization of a biblical vision -- one in which the world is near its end, God flattens everything (with specific reference to flattening Lebanon), and which refers to the eytmological precursor of the Palestinians as tricksters and child molestors. It appears that Bibi went to the George W. Bush Bible school. The crisis has revealed the importance of strengthening our commitment to standards of propriety, integrity and transparency. To address these issues in a comprehensive fashion, we agreed on the need to develop the Lecce Framework – a set of common principles and standards regarding the conduct of international business and finance – which builds on existing initiatives and lays the foundation for a stable growth path over the long term (see the attached annex for details). In the annex, this appears to be a packaging of a range of existing initiatives into a commitment that everyone participating in market exchange should be excellent to each other. 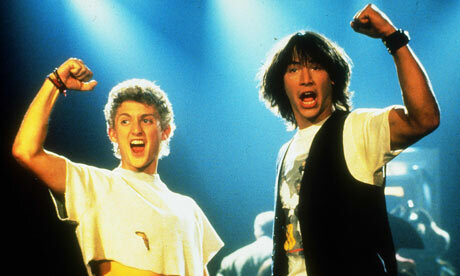 Party on dudes! Government expenditures rose by 138% in nominal terms over the past decade, a time when the economy itself grew "only" 72%, according to Constantin Gurdgiev of Dublin's Trinity College. Much of that spending went to social programs and civil servant salaries. Combine those commitments with a tax base reliant on the bubble-prone property sector, and Ireland faced a 12.75% deficit this year before a new budget trimmed that to a still whopping 10.75%. Which brings us to the other lesson, on the dangers of overly hasty government intervention even amid a financial crisis. Irish policy makers know how to spur an economy. Witness the country's low corporate tax rates, which fueled foreign investment and economic growth and transformed Ireland into the Celtic Tiger. Annual GDP growth of between 8% and 12% from 2004 to 2007 was fueled by a credit mania, especially in euro-denominated real-estate borrowing. Total residential mortgage debt hit 33.7% of GDP. Households now have to deleverage, while the government needs to restrain spending. Yet instead of allowing nature to take its course, a growing chorus is calling for a devaluation of the lats, which currently trades in a band of plus or minus 1% around the peg of 0.70 lats to the euro. Some devaluationists argue that an inflation rate higher than in the euro zone has pushed the real lats exchange rate out of whack, thereby making Latvia's exports less competitive. Now we're confused. Those naughty Latvians also allowed government spending to grow by a lot, but apparently their problem was excessive credit growth and falling competitiveness due to relatively high inflation. Which is pretty much the story for any economist who actually looks at the Irish situation. But a cheaper lats won't magically revive the U.S. and Western Europe export markets that are suffering recessions of their own. Latvians would have to repay euro-denominated loans with more lats than before, squeezing household budgets. Default rates inevitably would rise, perhaps to as high as 30% or 40% of total loans, estimates economist David Roche of London-based Independent Strategy. That would be a blow in particular to the Swedish banks that have loaned so heavily in the Baltics. A Latvian devaluation could also put pressure on Lithuania and Estonia to follow suit. The alternative as the WSJ sees it is large borrowing from the EU and IMF to permit large cuts in public spending. Since Ireland is already in the eurozone, devaluation is not an issue. So is that also their implicit recommendation for Ireland? This low tax mania and the deregulatory ethos that accompanied it doesn't seem to have worked out especially well for either country. Could it be that the public was confronted with the full implications of the WSJ economic recipe -- i.e. the need for slash and burn fiscal policy in a recession -- it might not be so popular anymore? No doubt the Belgians are already impressed. Not that they could do worse than Sam "Foxy" Fox, rammed in by Bush as a recess appointment when it was clear that the Cheney crony would not be approved by the Senate. Mr. Beyer was elected Lieutenant Governor of Virginia in 1989 and served until 1998. In that capacity, he presided over the Virginia Senate, earning the reputation as the most activist President of the Senate in Virginia history. Also known for the Don Beyer Volvo dealership chain. Bush sent car dealer fortunes as ambassadors to the eastern Caribbean and the UK, so again we're ahead. But the general sense is that ChangeTM won't be coming to this particular aspect of the President's job. Final question in this Colbert style interview of Ronaldo with the one person he feels meets his high standards. Jonah Goldberg and Dan Hannan MEP are expressing outrage that fringe individuals and groups like the Holocaust Museum shooter and the British National Party are routinely described in the media as "extreme Right". This, they say, is a slur on mainstream right-wing movements. At one level they have a point. "Right-Left" or "Conservative-Liberal" gives one only one dimension to work with, and trying to squeeze multi-dimensional attitudes and perspectives on to it is bound to cause problems. But is it really as difficult to come up with a meaningful interpretation of right-left for the situation of extremists as Goldberg and his readers think? There's nothing especially original about the notion that right-wing=backward-looking and left-wing=forward-looking, but it gets you a lot. Right-wingers of every stripe are inclined to think that from an institutional perspective, things were better in the past than the present, or are better in the present that they would be in the face of various changes in the future. Left-wingers of most stripes are inclined to think, by contrast, that institutions have gotten a lot better or could be made a lot better. This is not to say that right-wingers don't accept material improvements in the quality of life. But they do think that values and mechanisms have deteriorated -- to take obvious themes: law and order, self-reliance, "traditional" education. The left is instead animated by a vision of alternative arrangements that could be quite different from the present. As a practical matter, outside of the counterexample of Maoist lunacy, you'll rarely see a left-wing movement looking back in time for a model of what society should look like. Hence the reason that no one is particularly bothered by the socialist-communist continuum since there is a philosophy of the need for change underlying both. So let's take the BNP. Hannan and Goldberg look at their policy positions, which are essentially protectionist, and note that such interventionist policies are usually found on the left. Therefore the BNP is left-wing! But the driving philosophy of the BNP is that Britain is a worse place than it was before. Worse because of immigrants, worse because of the European Union, and on the fringe-within-the-fringe, worse because of the Jews. To belabour a phrase, it's a "reactionary" movement, one which harks back to a lost age of a white Christian Anglo-Saxon Britain. Take out the philosophy and of course you end up with a jumble of policies that can be easily packaged as "left". But then what's the point of the BNP? And then the Holocaust Museum shooter. For him it's also a lost age, with the Jews and the Fed as the major culprits. A reverence for "tradition" and abhorrence of "change", albeit carried to a deranged conclusion. But without that last clause, he'd be described as a right-winger. Abdul Nasser, one of the four detainees who landed in Bermuda early Thursday morning, issued a statement through his lawyers, saying: "Growing up under communism we always dreamed of living in peace and working in free society like this one. Today you have let freedom ring." Note that unlike George Bush's version of the freedom phrase scrawled on the note to Condi, the Uighir detainee appears to be quoting the phrase correctly. And his praise refers to Bermuda, not the USA! There are at least two strange things about Paul Krugman's NYT column on the UK economic crisis and Gordon Brown's role in it. First, he ignores that there is a 2nd opposition party, the Liberal Democrats. But second, and more importantly, he thinks Gordon Brown should be getting credit for using activist fiscal and monetary policies to combat the crisis -- the same policies for which he has been bashing Hank Paulson, Ben Bernanke, and Tim Geithner since the crisis erupted. "Voluntary repatriation is on the agenda right now, paid for by the Labour party, it's been on the statute books since 1972, and it's available to people of ethnic minorities it's not for instance available to white Ulstermen or white Irishmen or their families who want to go back to their islands so at present there's actually a bias in favour of non-whites, non-indigenous people, so there's racism there." His speech was rife with moral equivalence ... The Holocaust was bad, but “on the other hand” so is the Israeli occupation of Palestine. The events are not comparable. On the other hand, it is also undeniable that the Palestinian people -- Muslims and Christians -- have suffered in pursuit of a homeland. Thiessen ignores the detailed discussion of the Holocaust and the specific attack on Iranian President Ahmadinejad for denying it, but in addition he appears to be using a definition of "moral equivalance" which only requires that several topics are mentioned within the same general theme regardless of the words used to describe them. Also little noticed was the fact that Obama announced a major shift in U.S. policy in the Holy Land. In 2002, President Bush declared in his Rose Garden address that America would only engage “Palestinian leaders not compromised by terror.” In Cairo today, Obama reversed this policy, declaring that Hamas has “to play a role in fulfilling Palestinian aspirations, and to unify the Palestinian people.” This is naïve and dangerous. Hamas does have support among some Palestinians, but they also have to recognize they have responsibilities. To play a role in fulfilling Palestinian aspirations, to unify the Palestinian people, Hamas must put an end to violence, recognize past agreements, recognize Israel's right to exist. Those conditions are no different than has been imposed on any other group, not least Fatah, which also has a "past compromised by terror". We could go on. Thiessen apparently wanted Obama go to Cairo and say how great the US military is. But it's a waste of time dealing with pure Rovian political hackery. Some things you can't make up. Serious leftwing film-making meets Irish stroke politics, with a critical role for the infatuation of members of the Irish elite for Manchester United. How Bertie Ahern hijacked the Irish premiere of the Ken Loach film starring Eric Cantona to generate a photo-op for his brudder Maurice. It may that Bertie's claim to be a socialist arises from his belief that he's a socialist because he's an Irish nationalist. He doesn't focus on who became the ruling elite after the British left. UPDATE: The stunt failed. Ahern even lost his council seat. The talks were attended Prince Naif bin Abdulaziz, the Second Deputy Premier and Minister of Interior; Prince Saud Al-Faisal, Minister of Foreign Affairs; Prince Sattam bin Abdulaziz, Acting Governor of Riyadh Region; Prince Ahmad bin Abdulaziz, Deputy Minister of Interior; Prince Miqren bin Abdulaziz, Chief of General Intelligence, and a number of US senior officials. Where was Prince Bandar? He was at the airport arrival ceremony but apparently when the talks got serious, he wasn't around. Q Are you reading at the moment? THE PRESIDENT: You know, I'm reading a book called "Netherland" by Joseph O'Neill. Almost finished. Excellent novel. The Right is already in anticipatory outrage over Barack Obama's visit to Dresden. It's part of an itinerary that will also take him to Buchenwald. The pre-outrage is due a supposed equivalence that the trip will draw between the Holocaust and the firebombing of Dresden. Leave aside that the White House has given no indication that such a link is intended where the focus is instead on Obama's wish to visit part of the workers paradise 100% voting turnout old eastern Germany. One of the unreasonable aspects of this particular outrage is its apparent assumption that there's somewhere in Germany one could stay that wouldn't have some awkward historical echo. For example, he could stay next to Buchenwald in the scenic town of Weimar. As in the Weimar Republic. Think of how much fun the critics would have with that. “This bill is the most important legislation for financial institutions in the last 50 years. It provides a long-term solution for troubled thrift institutions. ... All in all, I think we hit the jackpot.” So declared Ronald Reagan in 1982, as he signed the Garn-St. Germain Depository Institutions Act. He was, as it happened, wrong about solving the problems of the thrifts. On the contrary, the bill turned the modest-sized troubles of savings-and-loan institutions into an utter catastrophe. But he was right about the legislation’s significance. And as for that jackpot — well, it finally came more than 25 years later, in the form of the worst economic crisis since the Great Depression. Unfortunately, this legislation does not deal with the important question of delivery of other financial services, including securities activities by banks and other depository institutions. But I'm advised that many in the Congress want to put this question at the top of the banking deregulatory agenda next year, and I would strongly endorse such an initiative and hope that at the same time, the Congress will consider other proposals for more comprehensive deregulation which the administration advanced during the 97th Congress. In other words, a critical ingredient of deregulation i.e. allowing commercial banks to engage in investment banking activities, did not come with the bill and in fact did not come in Reagan's term at all. This probibition ("Glass-Steagall") was undone through case-by-case waivers until eventually being formally abolished by Gramm-Leach-Bliley in 1999. Krugman makes the strange choice to zero in on what was essentially a legislative painkiller for a terminally ill patient (fixed rate lenders with variable rate costs) when there was a much broader philosophy at work, dominating "mainstream" political consensus for 25 years, that got us in the shambles we're in today. Whether it was our own misconceptions or those of the US cable news chatterers this morning, much of the coverage of the Air France tragedy seemed to assume that the plane would be taking a standard North Atlantic route. Elements of the actual information associated with the chatter didn't seem to make much sense, however, and sure enough this France 2 map shows that the plane didn't take such a route. Perhaps to minimize time over water and with less of the northern short-cuts to play with, Africa features heavily in the route.